Hi, what an interesting idea. Don’t have a good transom shot, but do have a story. 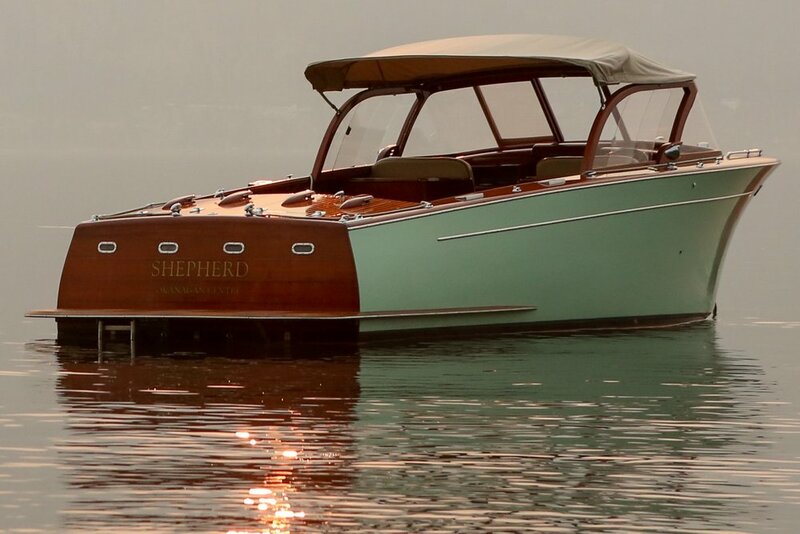 Our boat is a 1954 27’ Shepherd. John and Jennifer Hindle , who were both wonderful characters, bought it in about 1961 and didn’t like the name and wanted to change it. Both also thought that it was very bad luck to rename a boat, soooooo….they landed on “Shepherd” after the builder thinking that that was not the same as changing her name! A little bit more history, it used to have the letters K.C.Y.C under the name. Which stood for Kipper Cove Yacht Club, which was the tiny harbour that they had at the original Eldorado Hotel (which they owned). This was very difficult to explain to folks who thought something was wrong with the letters…Kelowna ? Yacht Club all the way to Kansas City Yacht Club. While we like the quirky history in her big rebuild in 2008, we changed it to Okanagan Centre, where she now resides.